GLAND, Switzerland – WWF is disappointed that the Marine Stewardship Council (MSC) certification of New Zealand’s orange roughy fishery has been upheld despite objections raised by WWF. WWF has significant concerns about this certification due to the use of bottom trawls in this fishery which is causing serious and irreversible harm to sensitive habitats and to ecosystem functions, with no effective strategy in place to ensure that this will change. Given the previous history of significant problems with the orange roughy fishery, WWF believes a highly precautionary approach must be taken in its management. Orange roughy is a long-lived, slow-maturing species living in vulnerable, deepwater habitats, and that congregates around seamounts which host sensitive ecosystems. “WWF does not believe that the assessment of New Zealand orange roughy properly considered the need for precautionary stock management and the impacts of the fishery on sensitive habitats like seamounts, and on endangered species like corals,” said Peter Hardstaff, Head of Campaigns for WWF-New Zealand. “WWF provided evidence that the conditions for certification should have been significantly strengthened, and we are disappointed by the adjudicator’s decision. WWF considers that there is scientific evidence of significant coral destruction where the fishery operates and this is not consistent with sustainable fishing,” Hardstaff said. “This outcome raises significant questions about the objections procedure. Identifying needed improvements in both science and governance is essential in the usual evolution of any standards and certification programs. WWF will be actively encouraging the MSC to learn from the orange roughy case and following up to seek important improvements in the MSC certification process,” Schumm said. WWF was a co-founder of the MSC and openly promotes MSC certified products. WWF considers that the full application of the MSC’s rigorous and robust standards and procedures is critical to ensuring the maintenance of its leadership position. However, in this case, until the issues raised by WWF in its appeal are fully addressed, WWF does not recommend the MSC-certified orange roughy fishery as sustainable or moving towards sustainability, nor does WWF encourage businesses and consumers to source from the fishery. WWF will continue to help the MSC to reach the highest standards possible and will work to support the MSC and its ability to drive change in fisheries around the world. 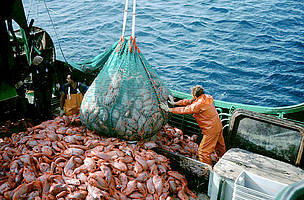 Emptying a mesh full of orange roughy into a trawler.